Below is a schedule of the informal LASP Magnetospheres Seminars for the Fall Semester 2010. Except where noted, seminars will be held on Tuesday afternoons in room LSTB-206 at 3:30 pm. Abstract: Our understanding of Io’s neutral atmosphere has improved tremendously in the last three decades thanks to multi-wavelength and high spatial resolution observations of the atmospheric emissions and absorptions. Nevertheless, uncertainties persist about the vertical column density, radial distribution and abundances of non-SO2 species. Clues about the structure of the outer layers can also be derived from plasma observations close to Io: When the Torus plasma encounters the neutral atmosphere, ionization and charge-exchange will change its density and temperature. We model the atmosphere/torus interaction with a multi-species chemical model and compare the results withthe plasma observations along 6 Galileo flybys of Io to constrain its outer atmosphere. Abstract: Recently Zhang et al. argue that crater-FTEs (C-FTEs) are initial stage of typical-FTEs (T-FTEs) and propose that the thermal pressure at the center of C-FTEs is reduced by the parallel flows as the central field strength increases to maintain the pressure balance. In this talk, I present a simple force-balance model to describe the evolutions of FTEs, instead of the pressure balance. The model can explain the THEMIS observations that there are less FTE in C-FTE than in T-FTE. Also, the model shows that C-FTEs are not necessarily initial stage of T-FTEs. Some interesting results from the model are discussed. 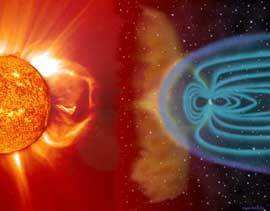 September 14, 2010 Oxygen in the magnetosphere: What role does it play in the formation of geomagnetic storms? November 30, 2010 What causes sawtooth oscillations in magnetospheric convection?